Best Contemporary Classical Composition and Best Classical Instrumental Solo awarded to Aaron Jay Kernis’ Violin Concerto with violinist James Ehnes at the 2019 Grammy Awards. The Recording Academy announced today that the Seattle Symphony won two awards in the classical category at the 2019 Grammy Awards. 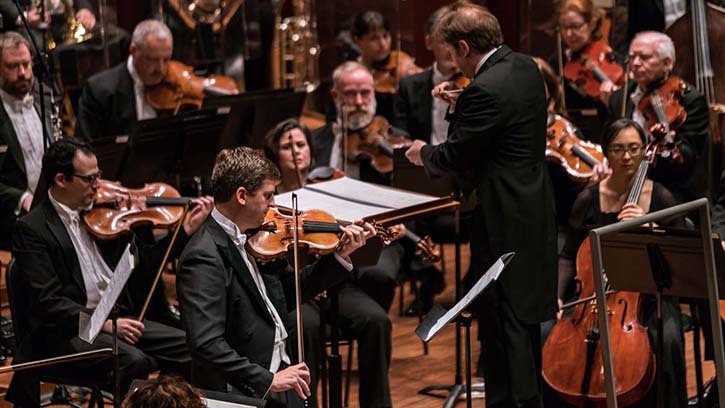 Music Director Ludovic Morlot and the Seattle Symphony won Best Classical Instrumental Solo and Best Contemporary Classical Composition for their work on violinist James Ehnes’ recording of Aaron Jay Kernis’ Violin Concerto, which was commissioned and premiered by the Seattle Symphony. “Congratulations to Ludovic Morlot, violinist James Ehnes, composer Aaron Jay Kernis, Recording Engineer Dmitriy Lipay and the musicians of the Seattle Symphony for this exceptional new Violin Concerto, which was enthusiastically received from the first moment our audiences heard it in Benaroya Hall,” shared Seattle Symphony President & CEO Krishna Thiagarajan. “Commissioning new music is one of the most important things we do, and it’s incredibly heartening to see the excitement about this new concerto extend to a Grammy win." The Aaron Jay Kernis Violin concerto was jointly commissioned by the Seattle Symphony, Toronto Symphony Orchestra, Dallas Symphony Orchestra and Melbourne Symphony Orchestra. The Seattle Symphony, conducted by Ludovic Morlot, gave its U.S. premiere with violinist James Ehnes in March 2017 at Benaroya Hall. Please join us in congratulating Ludovic Morlot, violinist James Ehnes, composer Aaron Jay Kernis, Recording Engineer Dmitriy Lipay and the musicians of the Seattle Symphony! You can listen to the recording below. The Seattle Symphony’s recordings and artistic projects are made possible by donations from music lovers like you. Join our family of donors with your gift today! The commission by Aaron Jay Kernis was generously supported by Patricia Tall-Takacs and Gary Takacs. James Ehnes’ performances were generously underwritten by Dana and Ned Laird through the Seattle Symphony’s Guest Artists Circle. The Seattle Symphony’s Masterworks Series is sponsored by Delta Air Lines. This performance was presented as part of the Seattle Symphony’s New Music WORKS initiative, which is supported in part by a grant from the National Endowment for the Arts. New Music WORKS features commissions, concerts and educational activities that use composition as a catalyst for collaboration and engagement in music. The Seattle Symphony is grateful to Joan Watjen for her generous support of Seattle Symphony Media CDs in memory of her husband Craig.